That we were lucky enough to get as a wedding present years ago. I was careful to lay the pavers in such a way that the cart would be able to go around all sides of the garden beds. I knew I might need that someday. I wasn’t expecting it to be this year! Ours is older and really needs to be sent for re-coating…. But that will wait until T is getting his tractors powder coated. Then we will have a green and yellow barrow. 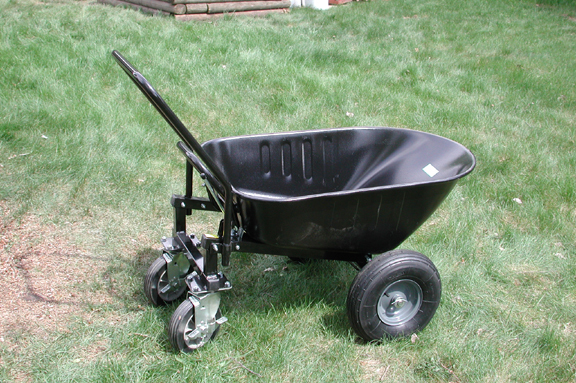 We like this style wheel barrow so much that a few years ago we got T’s mom one too! I know most of the world can plant before Victoria day Long weekend, but I am in gardening zone 2b (subarctic) and so even though I was working on prep, the seedlings didn’t go into the ground until this weekend. Our budget is a little tight, since I’m not working and not getting WCB benefits but T’s mom took to to green houses and paid for my seedlings! Yay! Thank you so much, Y! But my garden is in! Yay!